With contraception, the Obama administration thought it had found a chink in the American Church’s moral armor. It was wrong. While it is certainly right to lament the fact the Obama administration is attempting to force Catholic institutions, through the Health and Human Services mandate, to provide insurance coverage for contraceptives, abortifacients, and sterilization, there is a bright side to all this. It may very well be a wily act of divine providence, a case of God using hostile secular powers to effect much-desired goals of the Church itself. In saying this, I don’t mean to undermine the gravity of the situation. The HHS mandate is an egregious violation of the Church’s moral doctrines, of the proper relationship of church and state, and of the First Amendment’s guarantee of religious liberty. If it is an act of divine providence, it is one of those divine goads—like the Church being forced to clean out child molesters among its shepherds by the onslaughts of the secular press—that we wish could have been avoided by doing the right thing to begin with. So, what seems providential about this whole mess? The HHS mandate has had the happy effect of forcing the bishops (and priests under them) to do something that they’ve sadly neglected to do for the last half-century: defend the Church’s teaching against contraception. They have been vocal enough against abortion, but about contraception, the near-silence has been deafening. The result has been that a reported 90-plus percent of Catholics interpret the silence as consent, as a sign that the Church’s ban on birth control is really, more or less, like the Church’s tradition of having only altar boys. The former can be overcome just like the latter by cheerfully ignoring the prohibition, and doing as one pleases until the Church catches up. There is little doubt that the Obama administration, in issuing the mandate, understood the situation quite well, and planned its strategy accordingly. The strategists knew the bishops have always been lukewarm in their defense of the Church’s prohibition against contraception. They also knew that the bishops were red-hot in their enthusiasm for national health-care. How likely was it that American bishops who couldn’t be prodded into a defense of the Church’s teaching against contraception would suddenly be galvanized into action by the state to defend this teaching, especially if delivered in the coveted national health-care package? Even more shrewd and ambitious, the Obama team might have reasoned that if it could get the Catholic Church to swallow contraceptives for the sake of health-care, that would lead to the affirmation of abortifacients, which would in turn lead to the eventual acceptance of abortion as such. And then, the single largest opponent to the social acceptability of abortion would lie submissively prostrate in the historical dust. The great battle that began with Roe would finally be over. If that weren’t enough playing into the administration’s favor in the gambit, Protestants have no problem with contraception, so it was inconceivable (pardon the pun) that they would ever rush to the side of Catholics to defend a moral doctrine they reject. No doubt it seemed to Obama’s strategic team that it had cleverly picked the weakest link, so to speak, in the moral armor of the contemporary American Catholic Church, one that would allow them to assert state control over the Church and its doctrines. This strategy, ingenious as it seemed, backfired precisely because the HHS mandate also included the provision of abortifacients (like Plan B and Ella) masquerading as contraceptives. Abortion is still a very, very hot-button issue for Protestants, ensuring their alliance in the cause, and a moral issue on which the Catholic bishops have remained stalwart and vocal. The administration’s “Plan B” plan blew up in its face, we might say, precisely because modern technology has smeared the dividing line between contraception and surgical abortion with morning-after pills. And here we have wily divine providence at work, turning attacks against the Church into (we may hope) astounding victories. If the Obama administration had included only contraceptives in the mandate, it would not have attracted so much sympathetic moral ire from Protestants who accept contraception but vehemently reject abortion. But including abortifacients lit a great spark under Protestant evangelicals, and so, much to the administration’s surprise, they’ve come running to the defense of the Catholic Church. Just as with the larger abortion issue, the inclusion of abortifacients is driving long-separated Christians together, uniting them against the secular state. But that is not the end of the wiles of providence. HHS Secretary Kathleen Sibelius (a dissenting Catholic) has recently tried to quell the fires by claiming that there actually are no abortifacients in the mandate; that they are all contraceptives. In doing so, she is obviously trying to calm the evangelicals opposed to abortion but not to contraception. But in trying to “erase” the nasty word “abortifacient” from the minds of those non-Catholics opposing the mandate, she is only calling attention to it. She is only causing evangelical Protestants to look more carefully at abortifacients as a kind of “class,” and that can only lead them from an examination of “Plan B” to the Pill, the most popular contraceptive that is also an abortifacient. And where would that end? Back at a discovery by evangelical Protestants of Pope Paul VI’s Humanae Vitae—the encyclical written against the Pill? To a kind of moral affirmation of the prescience and courage of a pope who, contra mundum, declared artificial contraception to be intrinsically evil? 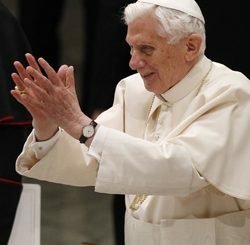 To a deep appreciation of the pope’s prophetic words about the “the danger of…power passing into the hands of those public authorities who care little for the precepts of the moral law,” authorities who might then, “favoring those contraceptive methods which they consider more effective,…impose their use on everyone”? As Catholics and Protestants unite in their opposition to the HHS mandate, they will talk about what the mandate is mandating, i.e., they will turn to a discussion of the Church’s moral prohibition of contraceptives and abortifacients. As Catholic dioceses around the nation celebrate the bishops’ declared Fortnight for Freedom (June 21-July 4), they will have to attend to the Church’s rejection of contraception and abortifacients among their own parishioners. In short, the bishops are at long last being forced by the mandate to explain and defend the Church’s teaching about the immorality of contraception both to outsiders and insiders, to separated brethren and its own flock, a task it has long declined to do. That will take quite a bit of moral courage, and that courage has—thanks to the HHS mandate—been ignited by the crude high-handedness of the administration in attempting to bully the Church into quiet submission. Now you might think that the bishops would evade this moral responsibility by taking refuge in merely defending religious liberty. I think that they are better than that. A moral corner has been turned, and under the leadership of Cardinal Timothy Dolan, president of the United States Conference of Catholic Bishops, the bishops are charging ahead, declaring that they are willing to accept jail and will close down their institutions before buckling to the secular state. But just in case anyone else might be thinking that the HHS mandate can be fought solely on the issue of religious liberty alone, we may take a closer look at how wily providence would disallow religious liberty to be the sole issue. The immorality of contraception, abortifacients, and abortion is the real issue; freedom of religion is secondary. There is no doubt that the bishops mean freedom of religion to be a means, rather than a goal or end; that is, they are concerned that the secular state not interfere with the church’s rightful activities and force it to act against its moral doctrine. While the bishops are using the First Amendment’s guarantee of religious liberty as a first strategic defense, they are ultimately making a moral argument; that is, they are arguing that contraceptives and abortifacients are intrinsically evil, and so the state is violating the Church’s moral conscience in forcing it to supply them through insurance. We can look at it from another angle to make this same point. 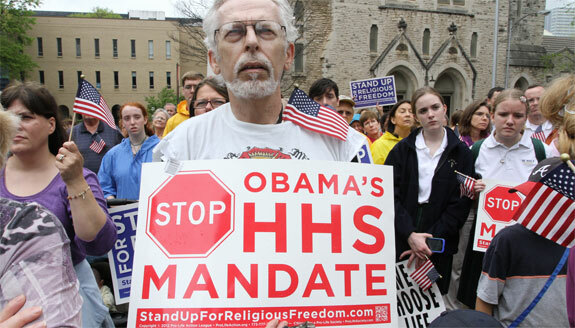 The bishops do not object to the HHS mandate merely because it is trying to force them to provide insurance. That is, they are not objecting to it on the same grounds as those now challenging Obamacare in general before the Supreme Court—that Congress has exceeded its constitutional limits in requiring individuals and associations to buy a particular service. The bishops are not, to say the least, upset by Congress misusing the Commerce Clause or violating Tenth Amendment’s guarantee of state rights. They are not objecting to Congress forcing their institutions to provide insurance as, in and of itself, a violation of religious freedom. They are upset because the mandate itself is trying to force them to act against the Church’s moral prohibition of contraception. And now for a bit of prophecy. The Obama administration knows that it’s gotten itself into a big fix with the HHS mandate, stirring up far more controversy that it ever dreamed possible. Look for something like the following announcement by HHS Secretary Sibelius: “We are going to remove Plan B and Ulipristal [the morning-after pills, a.k.a., abortifacients] from the HHS mandate. Only contraceptives will be covered.” The hope will be, of course, that with abortifacients removed, most Catholic and all Protestant animus will be assuaged, and the mandate will be smoothly accepted on August 1, 2012 when it is slated to take effect. I believe that wily providence will already have anticipated this strategy, and it will backfire precisely because both Protestants and Catholics will have discovered that most contraceptives are also abortifacients, and even more hopefully, that contraception itself is morally wrong.